Throw your hands in the air, Christmas cookie baking season is here! 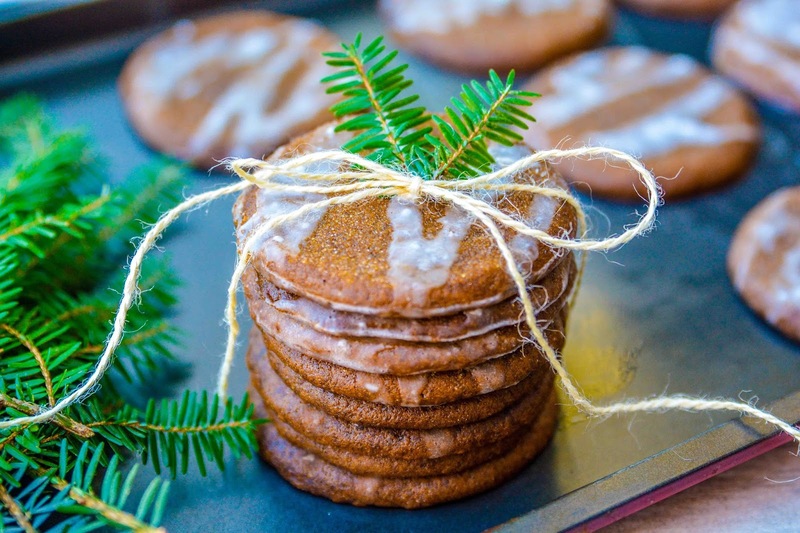 We all know that a balanced diet for Santa is two cookies in each hand, so let's get down to business and whip up a batch of these Holiday Spice Cookies from Golden Blossom Honey. This cookie offers a hit of all of the spices that scream Christmas, so if you love nutmeg, cloves, allspice and a hit of molasses, this recipe is for you. There are several ways you can shape these cookies. They can be done as traditional rolled cut out cookies, or you can do what I did and just make them into little balls, then flatten them into cookie shapes with the bottom of a sugar coated glass. Once baked and cooled, splash some glaze on the top, tie a stack up with bakers twine, then you have a delicious hostess or cookie exchange gift. With the second half of the dough, I made holiday thumbprint cookies by pressing a well into the centers then filling them with strawberry jam and chopped walnuts before baking. Honestly, I prefer the jam filled version of this cookie because you can really mix up the flavors with different fruity jams and jellies. Any way you make them, they bake up soft and chewy. These cookies would be delicious to snack on next to a warm fire and served with a steaming mug of hot cocoa. I am sure Santa would agree. 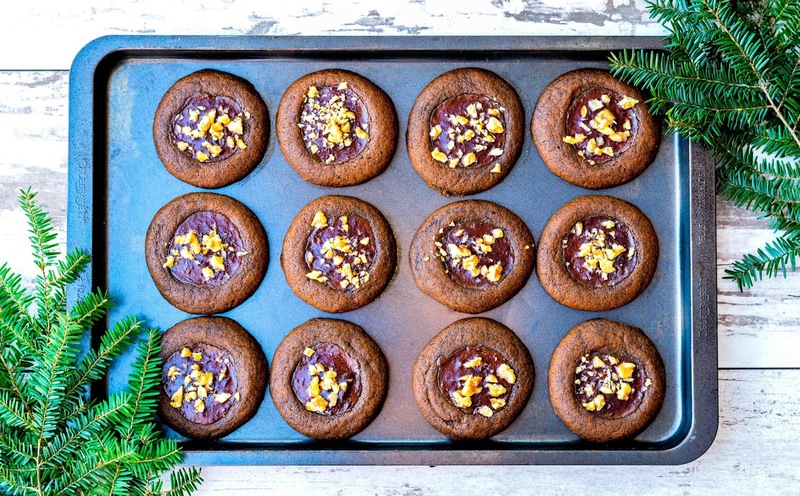 Have you started your cookie baking this season yet? I'm so excited! Now, hopefully the post won't go as slow as it did last year! They have seemed to be getting their stuff together though, but we'll see. I've sent little something something this morning, my cunning calculation is that it will arrive to you right on Christmas Eve like last year because Dezzy always has perfect timing :) The postage cost about two times more than the content of the envelope but it wasn't as bad as last year LOL when the postage was about six times the worth of the content :) We need a pigeon to fly letters and packages over the ocean. When you find that package carrying pigeon, let me know. I swear, postage rates can get quite ridiculous! They will sure make Santa a happy camper when he stops on by. lol on the balancing act. That's the same diet my kids try to ascribe to this time of year. ;) These cookies sound great, and your photos of them are festive and lovely! I'd like to know if you or Daisy does the cookie baking? Those look amazing! When the holidays roll around, cookies get SUPER awesome. They get creative and they get filled or topped with almost everything. I'm starting this weekend. Two weeks ago I did fall leaf cookies. These look great. Possibly I'll try them. These looks so yummy! I love your cute packaging with the jute. Makes the bundles look so festive. Looks like a simple recipe too! I bet those smell and taste delicious. I love to add honey when I am baking, I use it instead of sugar. I am pretty confident Santa will love those holiday spice cookies on Christmas Eve. Yummy idea! Those flavors are sounding super comforting and delicious! I could really go for a batch! They look delicious, especially the ones with a well in the centers. Oh my! The thumb print cookies with jam sounds incredible! I will have to give these a try for our cookie swap this year. These look delicious. I am a big fan of soft and chewy cookies like these. These cookies look delicious! I am so going to make these for the holidays! Santa's going to be so spoiled this season! I think these cookies are awesome and I'd love to make them at home! That is a really great recipe idea! It would make for a really great gift too! I am totally trying these. Santa is going to love them! looks really delicious Theresa !